This week we’re doing something new here at Life In Student Ministry. I asked you all on Facebook what questions you’d like us to answer and this week each of the authors here will answer the most “liked” question from their own perspective. Adam Wormann started us off last Monday and Tim Schmoyer followed with his post on Tuesday. Jonathan McKee chimed in last Wednesday, Mark Riddle shared his input yesterday, and now Tony Myles wraps it up. Imagine you walk into a restaurant to meet a friend for lunch. He’s already ordered and is munching on something you’ve never seen before, let alone tasted. You scan the menu, and are leaning toward ordering something familiar. As you look at the odd food across from you, you can’t imagine why you’d ever pay money for that. Although… for some reason you’re intrigued. Your friend’s face is a mess. He has thrown himself into his meal. You ask if you can try some. Or how about this: Imagine you walk into a restaurant to meet a friend for lunch. He’s sitting at the table waiting for you, and you ask if he’s ready to order. Which scenario metaphorically describes how you try to get kids to read the Bible? Do you simply enjoy it out loud, or do you read it because you’re supposed to? Kids can tell the difference. They will either ask for a bite of what you’re chowing down on, or they will nod their head at your expectation and likely fall short of living it out. Keep in mind, you’re trying to get kids to fall in love with Jesus and not the Bible. If they feel pressure from you to take on a holy habit, they may miss the point behind it. Teenagers typically take on the appearance of Christianity without it transforming their lives and will try to fit into social circles through what’s expected of them. When they fall short of living it out, they intrinsically feel the guilt of letting God down (and possibly you, too). As a young Christian, I heard how I “should” have a morning quiet time every day. If I couldn’t do that, at the very least I ought to end my day with God by reading a chapter of Scripture. I had zero consistency with either. I eventually discovered how to read the Bible in personalized bursts that help me connect with God. I start reading and don’t stop until I find something that stands out to me. Then I pause and don’t read any further until I feel I can’t squeeze anything else out of those verses. Sometimes that “pause” lasts a few days, and other times it’s longer. During that time I tell other people what God is challenging me with through it. Hand out actual Bibles during your youth program versus putting the verses on a screen. Give them a page number, or teach them how to use the table of contents to find what you’re about to read. Ask three different kids to read the same passage of the Bible, and talk about how their different styles helped highlight different portions of it. Give context to your lessons by inserting a visual timeline to your teaching. Mike Novelli offers some free icons through Echo The Story, or you can create your own. Let kids know when what you’re talking about happened so they can feel like they better grasp the big picture of Scripture. 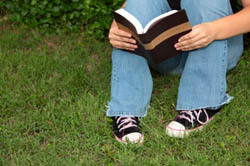 Build an early morning optional Bible study time into retreats. Use it to model and empower kids to wrestle with the Bible instead of merely read it. Post a large piece of butcher paper on the wall and write a passage of Scripture on it. Ask kids to read it privately, then come up and write observations or questions that they want you to address that night. Again, none of those ideas matter if you don’t care enough to read the Bible yourself. If you want kids to crave God’s Word, then you need to be able to tell them what it tastes like. Otherwise they’re taking getting nutrition advice from someone who barely eats.